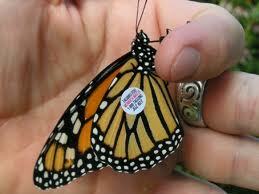 Central Montessori Academy has participated in the Monarch Watch tagging program. In Rene’s Lower Elementary room, the students have raised two caterpillars brought in by Brendan Bohon. The class studied and photographed the different stages of development and because of their good care, Monarch butterflies appeared from their cocoon. The class then tagged the butterflies with special identification stickers provided by the Monarch Watch research program. Hopefully, these two butterflies will make it their migratory destination in Mexico and be part of a resurgence in the Monarch Butterfly population. Great Job Lower Elementary!